More than 90 years after they were first published, James Cowan’s accounts of the New Zealand Wars continue to resonate. The wars, and Cowan’s role as a chronicler, were key themes of Borderland, an exhibition in the Turnbull Gallery curated by my colleague Ariana Tikao. One wall of the gallery space was devoted to Ōrākau, the site of the iconic 1864 battle and where Cowan’s family farmed from 1870. 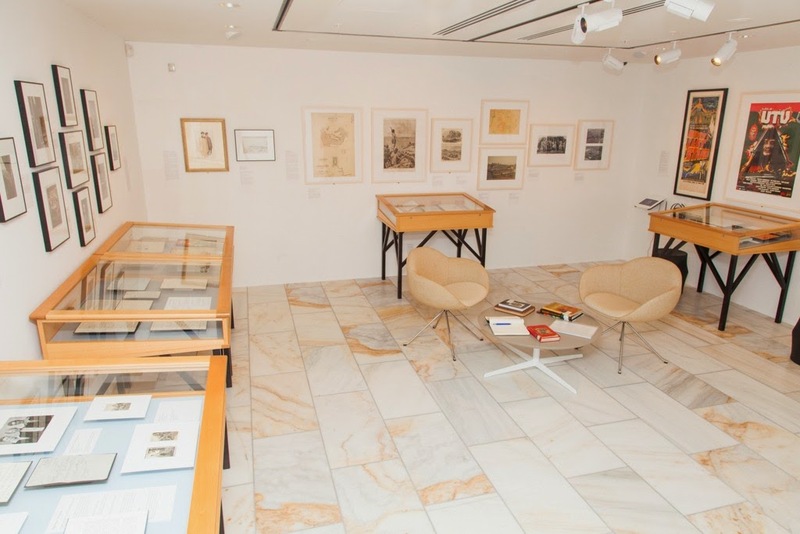 View of the Borderland exhibition in the Turnbull Gallery. Photo: Mark Beatty. As Ariana noted in her exhibition text, Cowan believed the shared experience of these wars brought Māori and Pākehā closer together. This theme was echoed in a tribute written by Prime Minister Peter Fraser after Cowan’s death: ‘He taught the larger lesson of mutual understanding; he saw the two cultures, Maori and Pakeha, meet and clash; he had a profound knowledge of the dignity and beauty of both, and his life was dedicated to their fusion’. Clearly, battles like Ōrākau, where Colonial troops surrounded Māori in an unfinished pā, were a clash of cultures. But were they also about mutual understanding and fusion? Attending the events for the 150th anniversary of the battle was a good place to consider this question. ON THIS SITE IN AN UNFINISHED PA ABOUT 300 MAORIS WITH SOME WOMEN AND CHILDREN, POORLY ARMED AND WITH LITTLE FOOD AND NO WATER, HELD AT BAY 1500 BETTER EQUIPPED BRITISH AND COLONIAL TROOPS, REFUSING TO SURRENDER, ON THE THIRD DAY A REMNANT OF THE MAORIS ESCAPED ACROSS THE PUNIU RIVER. The third plaque informs visitors ‘THIS PICNIC AREA WAS CONSTRUCTED BY THE WAIPA COUNTY COUNCIL TO MARK THE CENTENNIAL OF THE BATTLE OF ORAKAU’. Picnic tables have only recently been removed, perhaps out of deference to the presence of a number of graves in the vicinity (as noted on the map plaque). Recent archaeological research suggests the pā was in a different area, behind and to the left of the car park, on the farm paddock on the other side of the fence. This area was the focus of the 150th anniversary events, away from the existing memorial area. Perhaps this was because of logistics – the small space couldn’t accommodate many cars and the road was closed to most traffic for the first day of the commemorations – but it could also be read as a symbolic rejection of the way Ōrākau has been ‘officially’ remembered to date. The text on the plaques unveiled in 1964 suggest Dansey’s view was a minority one. In 2014 it wasn’t just the physical siting of the commemorations that signalled a challenge to the ‘laundered legend’ of the wars. The 150th anniversary commemorations were led by Māori, quite distinct from the 50th and 100th anniversaries. The events also attracted dignitaries whose predecessors were absent in 1914 and 1964: the Māori King, the Prime Minister and the Governor General. For the first time, the commemorations featured a hīkoi from the battle site to the Puniu River several kilometres away, where the battle survivors fled from the colonial troops. We arrived just before 7.30am, in time for the first pōwhiri between Waikato Tainui and other iwi who’d joined them at Ōrākau. After some of the whaikōrero, framed paintings and photographs of tipuna were presented to the King and displayed on a temporary wall. Waikato Tainui welcoming iwi from around the country whose tīpuna fought at Ōrākau. Photo: Mark Bagnall. Then it was time for breakfast – served a few hundred metres away, beside an espresso cart in the middle of a paddock (just visible at the right of this image). Parakuihi – breakfast in the sunshine at Ōrākau. Photo: Mark Bagnall. After breakfast, it was time for a second welcome, for the Crown representatives. By now, the sun was at its height, and it became more obvious that we were in drought-affected Waikato. The baked ground meant that the whakataukī (proverb), tutū te puehu (stirring up the dust) – referring to the speaker stirring up dust with the power of oratory – was literally true. Haka pōwhiri - dust rising at Ōrākau. Photo: Mark Bagnall. After the pōwhiri, a series of speakers addressed the crowd, including two young people, who both made a connection between the New Zealand Wars and the conflicts remembered on Anzac Day. Corey Wilson, a Junior Black Sox player and recent Commerce graduate, asked why Anzac Day was commemorated in nearby Kihikihi but not the other conflicts much closer to home, such as Rangiaowhia. 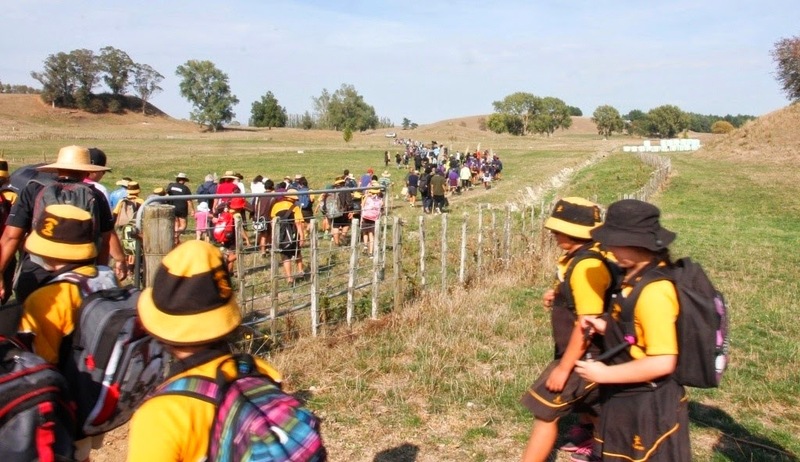 ‘We need to teach all our children about these battles.’ Wilson was followed by Melissa Carpenter-Monk, a teacher at Waipa Primary School, who’d only recently learned about the New Zealand Wars, even though her ancestors fought on both sides. ‘I understood Anzac but had no concept of what happened on our own shores. Monk called for better recognition of the battle site, ‘this paddock where farm animals graze and poo’. This theme was continued by the final speaker, Kaawhia Te Muraahi, the President of the Ōrākau Heritage Society, who reiterated a call for the establishment of a national day of remembrance for all the victims of the colonial wars. This would bring the wars of the colonial period into the Anzac frame. Kaawhia said the lessons of Ōrākau are about forgiveness and compassion, ‘that’s why it’s important to keep the narrative alive’. He called on those assembled to support the proposal for the Crown to purchase the battle site from the owners Sue and Chris Kay, who want to sell. The next day, Chris Kay was part of the group who led the hīkoi to the Puniu River. Looking back 100 metres from the start of the hīkoi, we had a different perspective of the pā site and its elevation. The marquees are roughly where the pā is now believed to have been. Looking back towards the site of the Ōrākau Battle commemorations. Photo: Mark Bagnall. On the hīkoi from the Ōrākau battle site to the Puniu River. Photo: Mark Bagnall. Along the way there were stops, and a sound system was set up for the sharing of stories about the battle. One of the stops during the hīkoi to the Puniu River. Photo: Mark Bagnall. Not all the stories related to the battle. Some reflected the experience of being brought together as a group – Māori, Pākeha, young, and not so young. Garrick Priestly, son of Ōrākau Heritage Society member Thia Priestly, had come across from Australia for the commemorations. During the hīkoi he spoke about hearing one Pākehā child ask another ‘do you want to be Māori?’ ‘Yes’, replied the other child, ‘but only half’. By the time the hīkoi reached the Puniu River we were all keenly aware of the distance the escapees travelled and how tired they must have been. The children and some of the adults headed to the river to cool off, while others sheltered from the sun. 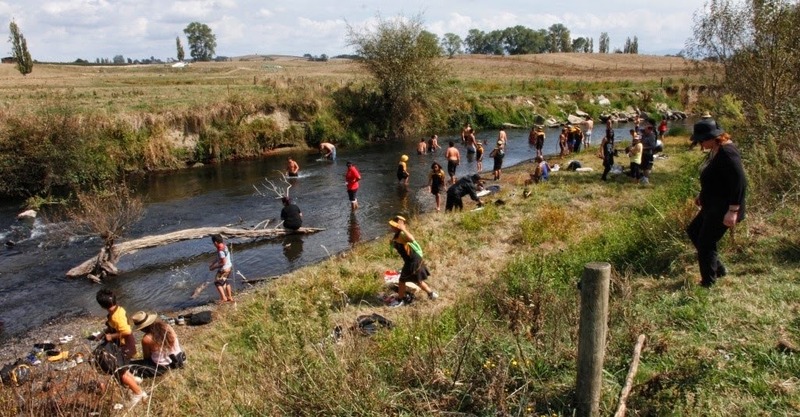 Participants on the hīkoi cooling off after reaching the Puniu River. Photo: Mark Bagnall. Before the group left to return to the battle site, signatures were collected ‘for the next anniversary’, and a group photo was taken. The group that walked from Ōrākau to the Puniu River. Photo: Mark Bagnall. Children from Kihikihi School did the haka they’d performed a day earlier. The haka includes the words of defiance attributed to Rewi Maniapoto, which look set to endure. The children have the best chance of being around for the 200th commemorations in 2064: what will they remember about the day? A swim in the sun? How will the battle be remembered by then? Will the students’ haka still be performed? How will people see the 150th anniversary commemorations? Children from Kihikihi School perform their haka about the battle of Ōrākau. Photo: Mark Bagnall. The walkers arrived back at the battle site at 3.30pm, the time that the pā defenders fled for the river. Chris Kay, who owns the land with his wife, spoke to the group, reiterating that he didn’t believe the land should be in private ownership. 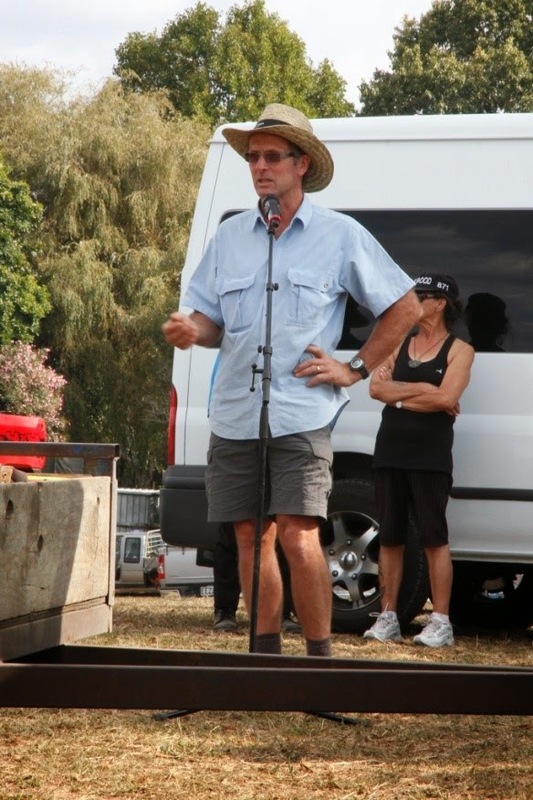 Chris (pictured) and Sue Kay own the land which includes part of the Ōrākau pā and battle site. Photo: Mark Bagnall. Whatever happens with the land, the events at Ōrākau in 2014 are an example of Māori and Pākehā working together. The commemorations (which have been happening since 2012, led by The Battle of O-Rākau Heritage Society Inc) wouldn’t have been possible without the cooperation and generosity of the Kays and the other land owners who facilitated the hīkoi. Perhaps Cowan’s vision wasn’t so far-fetched after all. He is responsible for keeping legends about the battle alive (many of the speeches at Ōrākau in 2014 quoted from his work), but it’s also important to remember that he campaigned for a memorial on the battle site. After the commemorations, plans were announced for the development of a living memorial. The memorials left after previous anniversaries speak to the attitudes of those times – what will be the physical legacy of 2014, and what will it say about this generation? Paul Diamond (Ngāti Hauā, Te Rarawa and Ngāpuhi) was appointed Curator, Māori at the Alexander Turnbull Library in 2011. He worked as an accountant for seven years, before switching to journalism in 1997. Paul is the author of two books (A Fire in Your Belly, Huia 2003; and Makereti: taking Māori to the World, Random House NZ 2007), and has also worked as an oral historian and broadcaster. From 2007 to 2009 Paul managed the Vietnam War Oral History Project for the Ministry for Culture and Heritage. Evening Post, 2 April 1914, Page 3; http://paperspast.natlib.govt.nz/cgi-bin/paperspast?a=d&d=EP19140402.2.31&. For more information about the 1914 commemorations, see paper by David Green (Commemorating Chivalry and Unity?) written for the symposium on James Cowan held at the National Library 21 February 2014. Belich, James, 'Myth, Race and Identity in New Zealand', NZJH, 31(1), April 1997, pp16-17.